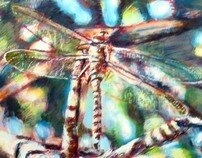 After being admitted to Sunnybrooke Medical Center at the age of 19 with End-Stage Renal Failure in 1979 I was permitted to take over an available space to set up a temporary studio, in order to re-build a bit of normalcy back into my shatterred life. 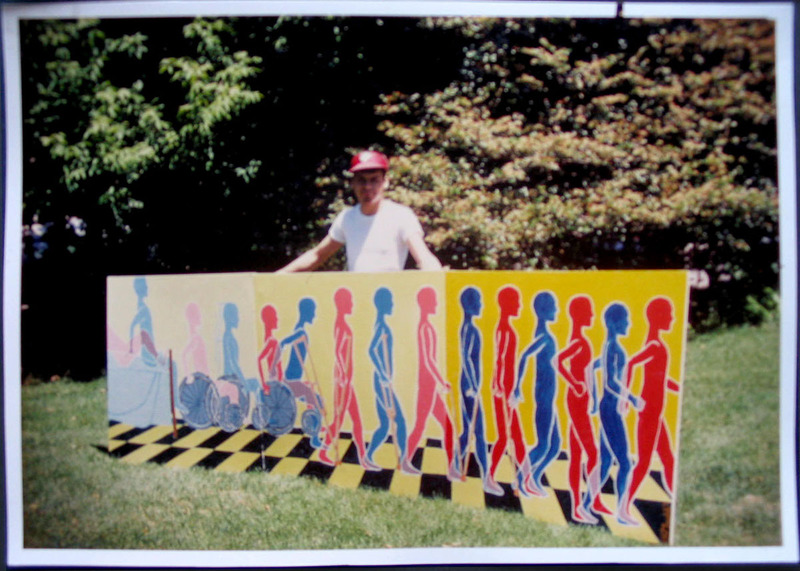 My first painting was a three-panel mural called 'RECOVERY I' that I designed as an invocation towards restored health, as I was undergoing dialysis therapy at the time. Six months later I received a kidney transplant from my brother Steven and now, in 2013 we are both still in excellent health. It worked out! Shortly after my successful kidney transplant in Halifax, I experienced a 'vision' of three triangles within a triangle that I thought might help clarify the 'mystery of the Holy Trinity' and with this in mind I showed my design to the Archbishop of the day, James Hayes. He apparently concluded that my design had merit, as he immediately designated a wall of the parish hall to host a full-blown mural based on my simple pencil drawing and my conviction. 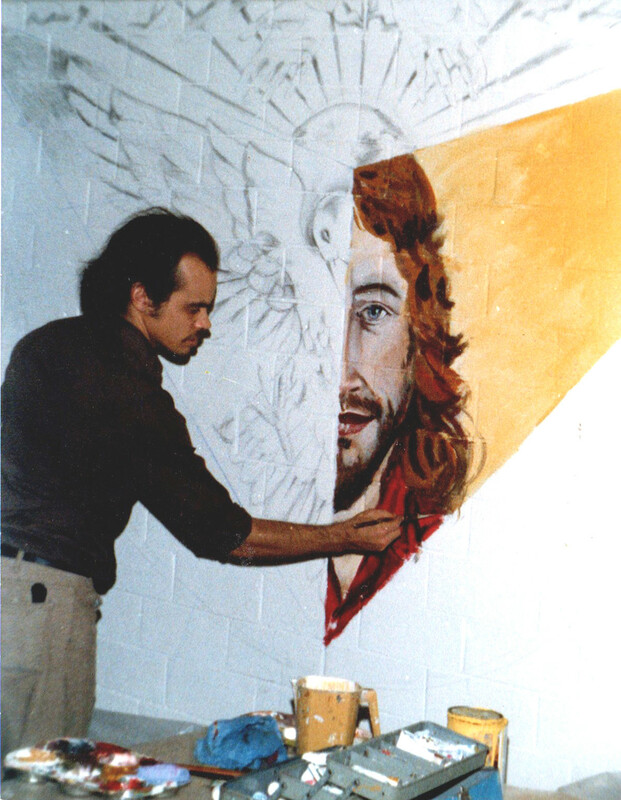 My first important mural commission was finished at St. Mary's Basilica in 1981 at the age of 23. It was an auspicious beginning to a career that would include over 60 large murals from coast to coast in Canada and still going strong! 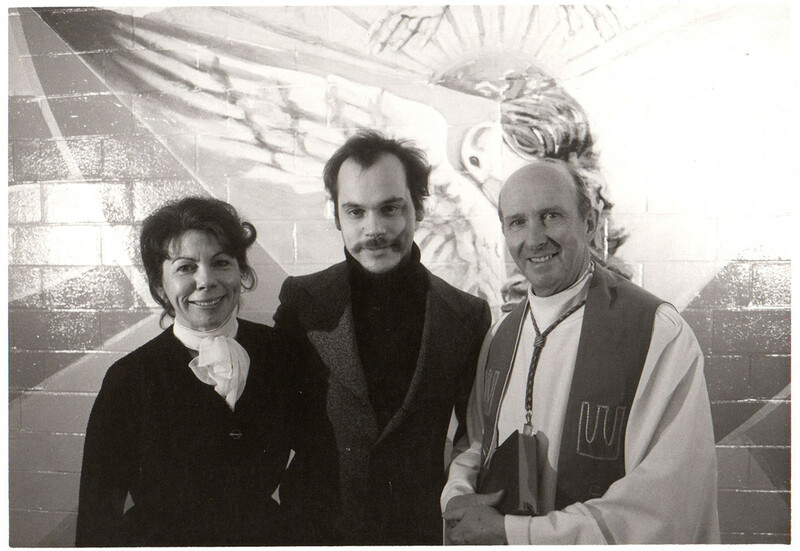 Standing with my mother Shirley Gaudet and Archbishop James Hayes in front of 'Trinity 1981' on the day of its official unveiling at St. Mary's Basilica in Halifax, N.S. 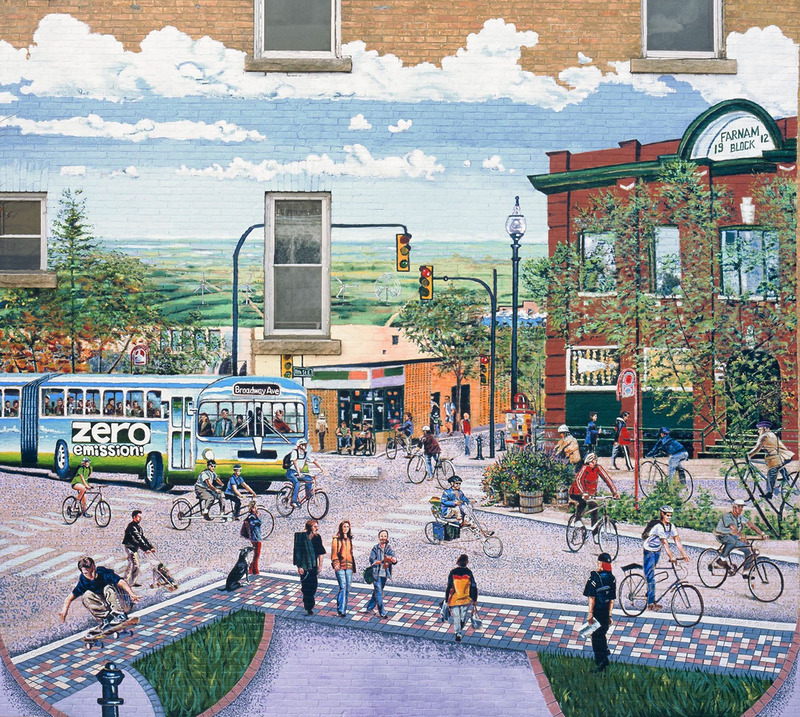 This 35' x 35' mural was commissioned by Jan Norris to be painted directly on the exterior wall of her building just off Broadway Ave in Saskatoon, SK. in 2001. 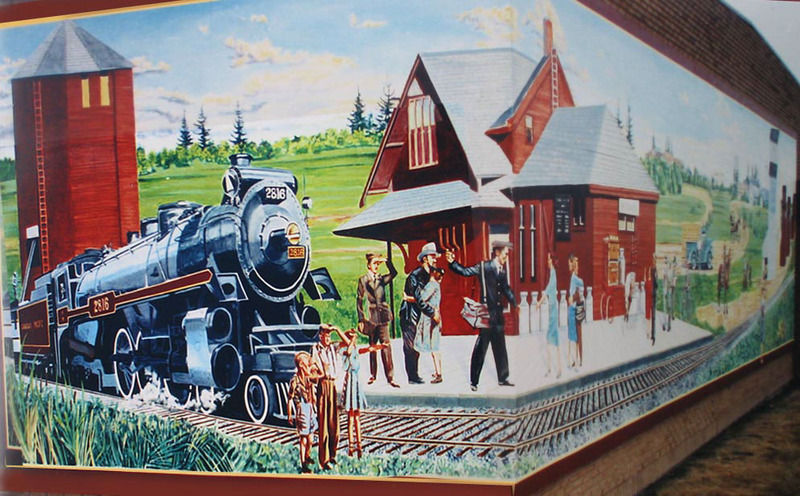 It was awarded the "People's Choice Award" for "Best Public Artwork" by the readers of Planet S.
Commissioned by Murals of Nipawin Inc. in 2006, this 12' high by 62' long piece was painted on multiple 4' x 8' painters' panels and installed on the exterior of the Liquor Board Store in Nipawin, SK. When viewed from its 'sweet spot' the design creates the illusion that the corner of the building disappears into space. The actual corner is utilized so that it corresponds exactly with the painted corner of the building in the mural, enhancing a very convincing 3-D effect for that extra visual buzz. Another commission from Murals of Nipawin Inc. 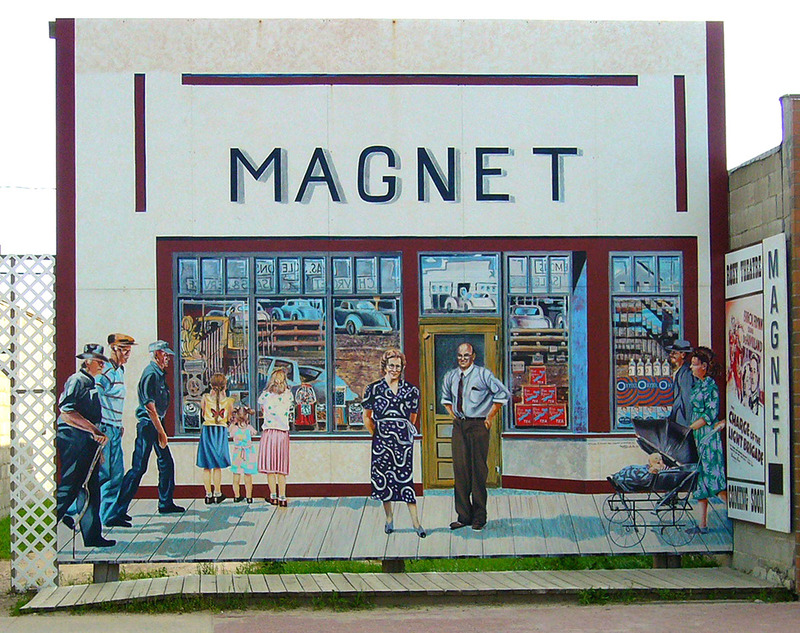 This life-size (16' high by 20' ft. wide) installation re-creates the Magnet Grocery that was a long-time fixture in downtown Nipawin until it was demolished in the late 70's, leaving a gap in the smile of the downtown facade. An interesting feature is the 1940's era merchandise on display in the big showcase windows as well as the original owners along with reflections in the windows of the stores from back in the day and the old-style automobiles parked in the street. This required a lot of meticulous research, which is an important component of every historic mural. A 'montage' style mural that shows various features of the Town of Maple Creek with a backdrop of the famous Cyprus Hills. Installed at at the very busy intersection of Idylwyld and 20th in downtown Saskatoon, this mural features cut-out silhouette figures on a gigantic (16 feet high by 62 feet long) scale that rise above the wall and present in strong contrast against the sky. Painted as usual with professional-quality artists' acrylics on painters' panel s and installed on a framework attached directly to the wall. was painted directly on the existing surface, not the best choice but required in this case. Painted with acrylics at Outlook SK in 2005.
under the auspices of His Excellency Roman Catholic Bishop of Saskatoon Donald Bolan along with my friend and mentor Fr. Sabah Kamoura, parish priest and spiritual leader of Sacred Heart Chaldean Catholic Church in Saskatoon, SK. By far my most challenging mural to date, March of Trinity was designed in close collaboration with Fr. Sabah Kamoura, parish priest of Sacred Heart Chaldean Catholic Church in Saskatoon, SK. This mural was unveiled on March 3rd, 2011. This huge (almost 1000 sq. 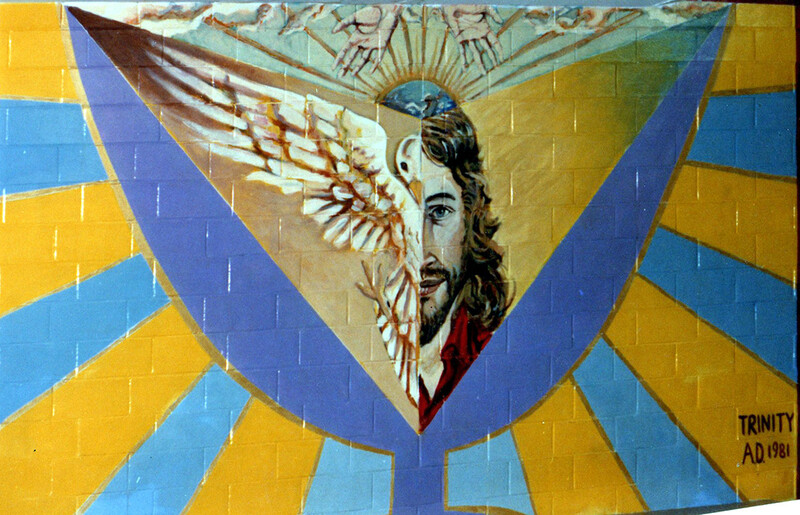 ft.) mural was painted directly on the existing wall and covers the entire sanctuary of the Church. The center section includes a constructed 'bridge' that arches across the expanse between the two outer raised surfaces to enhance the 3-D effect of the design while generating an organic line to create a very realistic looking stone grotto with three huge niches. (See the virtual tour by video below.) Visit my blog to see the UNVEILING of the MURAL. In this photograph, I am resting in front of the recently completed mural with my daughter Ilara Stefaniuk-Gaudet, who worked as my mural-painting apprentice. My largest mural to date, 'forever YOUNG' is painted on a total of fifty 4' x 8' painters' panels for a surface area of one-thousand and six-hundred square feet. 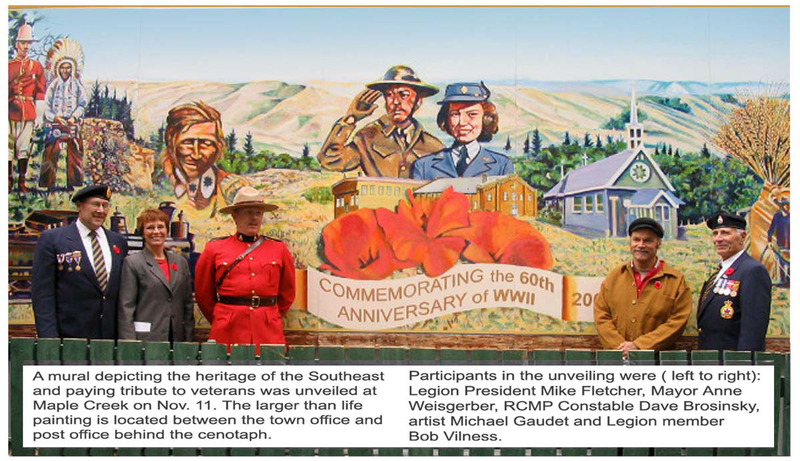 The mural was commissioned by the Centennial Planning Committee at Young, SK to commemorate the village's 100th birthday in 2010. The mural is scheduled to be mounted in its own dedicated park south of the village facing the busy # 2 highway in the coming months. Taking a pause for the cause...you can see the mural on its temporary frame stretching eighty feet away in the space that was allocated as a make-shift studio: the hockey rink at Young, SK. Talk about the all-Canadian studio! 'Forever YOUNG" was designed to reflect that 'farm life and history' of the Village of Young and as such all of the 'vignettes' are depictions of actual people and events gleaned from the local history book and family photographs. This detail shows a scene from the final fund-raising dinner that paid down the mortgage on the Community Hall. So everyone portrayed in this detail are well-known citizenry of the Village. Detail of 'forever YOUNG' from the lower ledt-hand side just prior to the mural being de-constructed for winter storage, awaiting its inevitable permanent installation in its own dedicated drive-in park. 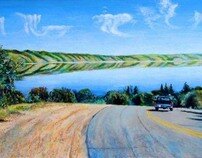 Plans are underway to create another 'tourist destination' here in Central saskatchewan with the erection of this monumental mural in the summer of 2013. Going up! A stunning photo of the panels being installed at Young, SK. in the summer of 2017. "forever YOUNG" mural is installed just outside of the Village of Young, SK in the summer of 2017. This mural is 20' high and 80' long, mounted 10' above the ground. "Dare to be Different" is painted in a private Edmonton residence celebrates and honors one of the oldest and largest living organisms on the plant today: the Giant Sequoia of Northwest California. This magnificent tree soars high above the old-growth forest which surrounds it. An owl may be seen strategically located high above the forest, serene in the expectation that the forest floor below will yield plenty of sustenance, as it abounds with a healthy bio-diversity. 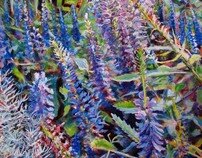 This feature was painted by Ilara Stefaniuk-Gaudet along with swaths of light and shadow in the forest. Please note the striking contrast between the well-rendered bird and its soft-focus envirin. This 'depth of field' greatly enhances the illusory three-dimensional effect of the mural. Working on the (almost) life-sized cut-out panel that depicts a 1955 Cadillac Convertible. This piece was installed at a residence in Saskatoon in the summer of 2014. A collectible and covetted work of art for the vintage auto lover. '55 Cadillac Convertible with Vintage Texaco Fuel Pump shown mounted after completion. The panels are painted with professional quality artist's acrylics for longevity. See something you like? Contact me at (306) 917-7719 to fire up your own distinctive, custom-designed mural or wall graphic. I was honored and thrilled to be awarded what was one of the most prestigous mural contracts of 2015 in the province of Saskatchewan... two murals for the Saskatchewan Government Employees' Union (SGEU). According to their Comunications Director the murals initiative was created to "honor the dignity of human labor". So, it made perfect sense to hire a Saskatchewan-based artist to hand-paint the images of a cross-section of SGEU member trades. 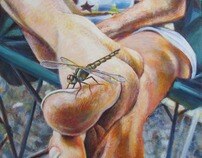 You will recall the 1st mural in this portfolio... the seminal "Recovery 1". This reincarnation of the design was created in 2015, as a "visual prayer' for a second kidney transplant. Alas, my (wildly successful) 1st transplant sustained me in excellent health for over 34 years, a longevity record in Western Canada! In mid-May of 2014 my kidney conked out, which means of course a return to dialysis. (See video below) Now, I am once again on the quest for a 2nd living donor. The revisited "Recovery" design now graces the cover of my book "Dancing with Rejection" and features, on the last figure (far right) a transplanted kidney in the lower abdomen. Canadian Artist Michael R. Gaudet explains the challenges of living with chronic disease while carving out a distinguished career in the visual arts as a painter of monumental murals. Now, he is publishing a book about it, called "Dancing with Rejection: A Beginner's Guide to Immortality". Mural painting is a specialty. Big or small no wall's too tall, we do them all!